As you can imagine, having a workspace full of cubicles that are each outfitted with different pieces of fabric-covered cardboard isn’t going to appear very professional. It would look like a shanty town where workers have to scrounge for scraps to build cubicles that actually help them be productive. Not exactly the kind of image you want for your office environment! In contrast, OBEX panel extenders allow workers to cut the level of noise they contend with while maintaining a uniform appearance from one workstation to the next. There’s no reason for any employee to be “stuck” in the cubicle no one wants. 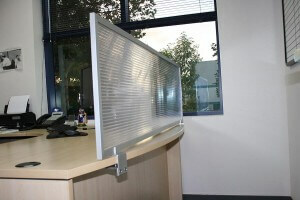 Instead, you can make every cubicle fully functional with panel extensions.